The Chinese team once again opened the event, encouraged by the entire public. Team Ice Pearl skated to a Madonna title by presenting some interesting pair movements. The three skaters brought a real flavor to the performance, one of them even made a double axel in the middle of a circle (total score: 94.95). From Turkey, Team Vizyon then interpreted their program on the theme of "Notre Dame de Paris". The different characters were recognizable, including Esmeralda who was dressed in a pink dress. For both programs, Zeynep Aydin's team totaled 97.81 points. It's with a piece of traditional Austrian music that the Sweet Mozart team started their free program. The atmosphere then became more "rock". We felt that the athletes were really emotional in front of the giant audience. They won a total score of 100.13 points. The team from Latvia presented a clean program, skating on different styles of music. At the end of their performance, the skaters jumped for joy. For the free program, Team Amber earned 66.48 points, for a total of 94.88 points. Orange flags rose in the stadium when the Dutch team, Team Illumination, enter on the ice. The program was run without falling, however, the first intersection has been executed with a few more hesitations. The team won a total of 112.80 points for both programs. The Belgians also had some trouble with the angled intersection. However, Team Phoenix had a very good score for their free program, which brought them 115.96 points overall. Zagreb Snowflakes then skated their "disco" free program. The intersections were once again the most difficult elements, as well as the twizzle element. The Croatian team nevertheless showed a very nice creative element at the end of the performance. The skaters won 116.35 points overall. After a very good short program, the Swiss team presented on Saturday a more hesitant performance on the powerful music "Survivors". With three deduction points, Team Starlight received 68.86 points for its free program (total: 108.99 points). To finish this second group, Team Icicles from Great Britain skated their free program on the theme of the "Lion King" in very original costumes. The team got 100.78 points for both performances, finishing just ahead of the Austrian team. Team Passion from Hungary presented a program with good speed. With a point deduction, the team dressed in blue won 97.27 points for its free program, which is 146.49 points in total. Representing the Czech Republic, Team Olympia presented on Saturday a very classic free program, which changes a lot compared to their dynamic short program. With a fall, the athletes won 146.95 total points for both programs. Team Berlin 1 made a very good free program despite a fall at the end of the whip intersection. The audience cheered the German team after its very well executed performance which presented very good moments. The death spirals, for example, have been made with a lot of speed and precision. Gert Hofmann's team totaled 171.18 points. The free program of Team Unity started with a lot of power. The team had a double fall in the death spirals. The Australians finished the competition with 121.32 points in total. A complicated trip... It was the theme of Les Zoulous free program representing France. The team coached by Alain-Daniel Hostache performed a dazzling and very creative performance and even presented a change of costume during the program. The audience encouraged the team when a lift has some difficulties at the beginning. The French champions received 153.00 points for their two performances. The Japanese team Jingu Ice Messengers started this group with a great performance. Apart from an individual fall at the beginning of the program, the team skated a clean program for a total of 168.47 points. Coach Andrea Gilardi jumped for joy! Then it was the turn of the whole team! Nino Rota's "Strada" has been beautifully interpreted by Italian Hot Shivers. The team has shown all its talent with a clean program skated with brilliance. Several creative elements never seen were realized and the public exclaimed. With a total of 174.41 points, they are ahead of the Germans. It was immediately the turn of the first American team to compete. 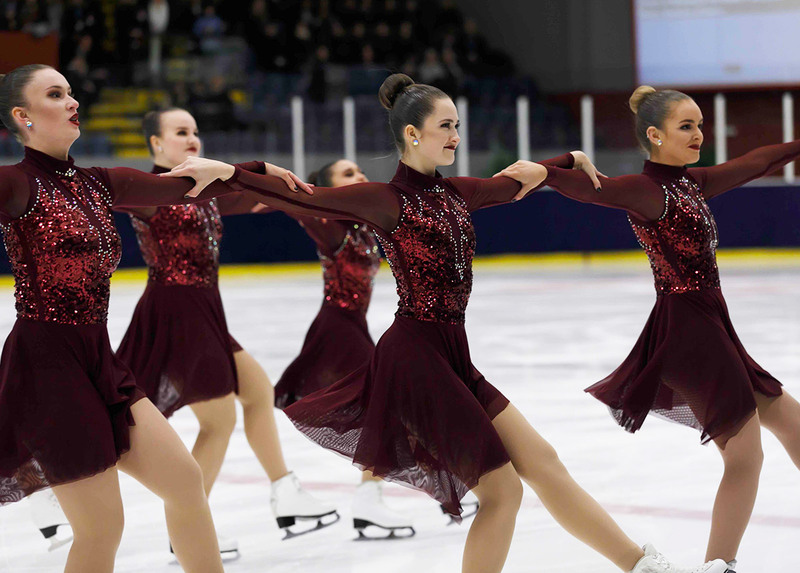 Skyliners skated their famous "Turandot" by Giacomo Puccini. The performance of the vice-national champions was clean and carried out with a lot of passion, which earned them 204.06 points in total. The crowd then vibrated with the performance of the Canadian champions, Team Nova. The team once again showed great energy on the ice as they interpreted their program on the theme of light. However, the formation had to count with a double fall in the death spirals. For their first participation in the World Championships, Nova got a total of 209.01 points. They knew how to make the show! The Haydenettes' performance was both solid and powerful. Skating on the famous music of "The Greatest Showman", the team performed a program without error to win 216.54 points in total. After their powerful short program, Team Tatarstan presented a free program composed of several variations and styles. The team encountered some difficulties with the intersections but, applauded by the public, realized a clean program. Tatarstan totaled 219.74 points. The whole rink screamed for the Helsinki Rockettes as soon as they entered the ice. Kaisa Arrateig's team was inspired by the audience's encouragement and presented a perfect program on the theme of "Radio Waves"! The score: 146.49 points for the free program for a total of 228.61 points. Nexxice from Canada has presented a delicate program. 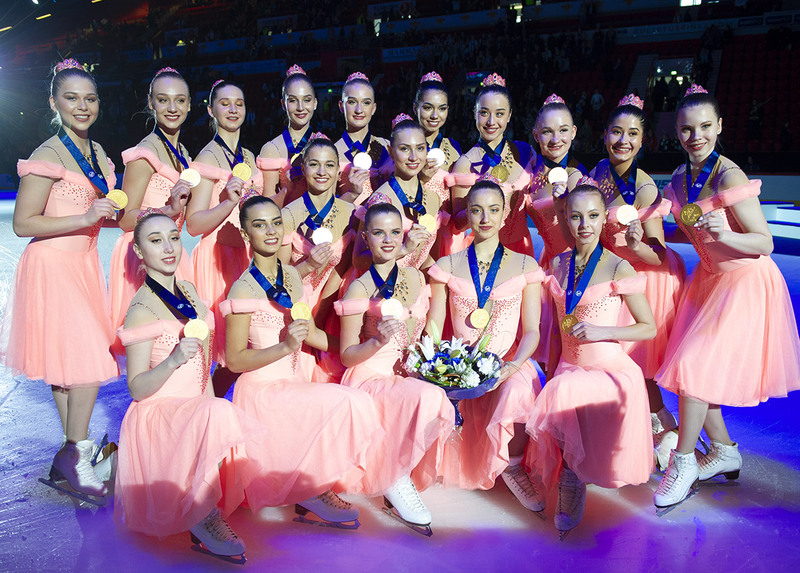 The vice-national champions skated gracefully on the music "This Womans Work" by Kate Bush. The team collected 139.79 points for their free program, giving them a total of 224.42 points. Then it was the turn of the World Champions to take the ice. Marigold IceUnity skated her famous "Transformers" in front of their own audience. The team led by Anu Oksanen, however, fell in the middle of the program. With a point of deduction, the Finns won a total of 142.80 points for their free program. They finished with 0.09 points more than their compatriots the Helsinki Rockettes. The competition ended with Team Paradise. This is a perfect program that the Russians presented in the early evening in Helsinki. For this performance, athletes coached by Irina Iakovleva have chosen the music of Johann Strauss "Die Fledermaus Overture" for their free program this season. The St. Petersburg team scored 147.26 on Saturday. Team Paradise becomes World Champion with a lead of more than 5 points. Bronze and silver for Finland, gold for Russia. The World Senior Synchronized Skating Championships ended in Helsinki in a festive atmosphere!